This somewhat gimmicky Amrut was a big hit at our local group’s most recent tasting. I call it gimmicky because it is: it’s matured in a combination of sherry, rum and brandy casks (Kadhambam means “combination” in Tamil, I believe). But, as an enemy of gimmickry, I am disappointed to say it works rather well. At some point though–and I hope it will be before someone has the idea of putting cashew feni into a cask for a year and then maturing some Amrut in it–they’re going to run out of these ideas. At that point I hope they’ll make the Kadhambam a part of their regular rotation. Nose: The quintessential Amrut polished wood (somewhere between rosewood and sandalwood) makes the first impression. Then there’s some powdered ginger and notes of chicory and cocoa. There’s also some maple syrup and dark honey and nutmeg and cinnamon and some brandied orange peel below it all. After a bit there’s a very nice nutty note as well. A really rich and dense nose. While I’m sure the rum and brandy casks bring something to the party as well, at the end this is very much an elegant sherried nose. Palate: The palate is a little thinner than the nose promises but there’s no denial of flavour: bitter, leathery notes leading into very sweet and sticky dates that then lead out to brighter tropical fruit: melons, pineapple, lychees, a hint of guava. Just enough tannic grip to rein it all in and just the slightest lick of smoke playing around the edges. Finish: Medium; the tropical fruit leads in from the palate but the polished wood makes the last impression (as it did the first on the nose). Comments: On the nose this is somewhere between bourbon and malt whisky. On the palate this is a dessert malt, best enjoyed I think with a nutty sheep’s milk cheese. This is not to say that you wouldn’t enjoy it any other way; it’s hard to imagine any circumstance in which this would not be an enjoyable whisky. This is my favourite, so far, of all the experimental Amruts. There’s just some undefinable oomph missing that keeps it out of the 90s. I did not drink it with water tonight but my memory from the tasting is that it swims quite well. 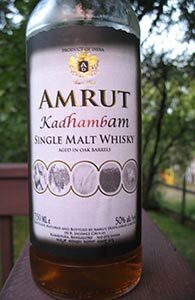 This entry was posted in -Whisky by Rating, 85-89 points, Amrut and tagged *Whisky, India, Single Malt. Bookmark the permalink. I’m on the second half of this bottle and I can’t believe I liked the first half as much as I did. Now it’s a solid 84-85 point malt: the fruit has faded and the gingery note is far more prominent on the palate.